This week, we catch up with Rachel Beth Egenhoefer — Design professor, artist and writer whose work integrates technology, craft, and design with a current focus on sustainability. Rachel Beth’s artistic work has been included in major exhibitions such as the Boston Cyber Arts Festival, La Noche en Blanco in Madrid, Art in Storefronts in San Francisco and at The Corcoran Gallery of Art in Washington, DC, The Institute for Contemporary Art (ICA) London, The Banff Centre for the Arts and many others. She has been an artist in residence at Tsinghua University in Beijing and the University of Brighton here in the UK. Newnham: Can you tell me about your background? What were you like growing up and how would your family and friends have described you?Egenhoefer: Growing up, I was exposed to many different perspectives and experiences. I grew up in the suburbs of Milwaukee, but went to middle-school at an arts magnet school in the inner city and high-school in the city as well. My parents would take us art museums, plays, the ballet, and all sorts of performances while also taking us to baseball and football games, sport shows, hiking and on camping trips. I was exposed to different political views, different cultures, socio-economic backgrounds, and ways of life. I don’t know if there was any one way to describe me because of this — I remember always doing different things and never really fitting into one category. Newnham: When did you first get excited about tech and moreover, the intersection of tech and design? Egenhoefer: I’m part of a generation that grew up as technology (as we think of it today) was also growing up. I remember writing stories and creating graphics on my family’s Commodore 64 computer and printing them out on a dot-matrix printer. I think I got my first email address my senior year in high school just as most people were starting to get dial up Internet in their homes and browsing AOL. I was in a small minority of teens who had their own cell phone, which the only thing you could do on it was make calls. Like most of my friends I got my own computer when I went away to college. All of these things were exciting to me, in part because they were new to most people. My entire childhood was pre-internet, pre-cell phone, pre-constant contacts and updates and feeds, yet I live and now work with all of those things all the time. I went to college at the Maryland Institute College of Art (MICA) where I took some video classes. I feel lucky that I was introduced to video at a key time in technological developments. All of the intro video classes at the time taught with tape cameras and analog editing machines. Halfway through my time in college, the first version of Final Cut Pro was released. I remember learning it alongside my professors - we were all trying to figure it out together. By the time I graduated, digital video had taken off. Seeing, feeling, hearing, touching, being a part of this shift from tactile tapes, giant knobs and reels to keyboard shortcuts and render times was very influential to me. At the same time that I was figuring out how analog tapes get turned into zeros and ones in the Video department, I was also in the Fibers department. I was attracted to Fiber because of the people in that department and the way they thought about concept, craft, materiality and construction. I saw so many connections between how we construct things that are both tangible and intangible. Because of these experiences, and the experience of growing up as technology started rapidly developing into people’s homes (and eventually pockets) I became fascinated by the hidden tactility in tech as we know it today. I always saw technology intersected with design because I was always interested in how it was constructed and what it was communicating as objects and experiences. Newnham: Can you tell us more about your career to date including some high and low points and how you overcome the more difficult aspects of your work? Egenhoefer: Like I mentioned, my BFA was in Fiber and Video from the Maryland Institute College of Art. As an undergrad I spent the summer of 2001 interning at ArtByte Magazine in New York. It was exciting to be part of the rise in culture around “new media” and “art+tech”. It also introduced me to writing and critical thinking about how technology is used and interacted with by both consumers and artists. Grad school was a great place to experiment and make work. UCSD is a research school, and being around a wide breadth of academics was influential to me. I was fortunate while I was in grad school to also travel a lot — I did a residency in Banff, I was in exhibitions in Europe and throughout the US. I also started teaching and realized my love for teaching at the University level. I liked the balance of teaching while also making work and still learning myself. I was fortunate to find work right out of grad school doing a little of everything — teaching, working as a designer, and making art. A few things lead to me a series of international residencies and I spent an entire year traveling. Mostly I was in China and the UK, but I also spent some time in South Africa, Germany, Spain, and in the US. In that travel I really began seeing and thinking about global supply chains and consumerism. This is when sustainability really entered into my practice. Shortly after I returned to the US, I was hired as a full time Design professor at the University of San Francisco (USF). In many ways it is a mix of my backgrounds — a small liberal arts school with interdisciplinary research and a commitment to social justice. I’m now the Chair of the Department of Art + Architecture and the Director of the Design Program. I feel really lucky to be able to teach classes that are related to my own interests such as Sustainable Systems in Design, Design Activism, Crafting Handmade Design, and others. Teaching influences my own work as I’m always having to do research and think about our relationships with the world. My role as an educator is also always evolving. Just as technology and the world around us is always changing, I’m always thinking about how we need to change curriculum and pedagogy to keep up not only with how to use technology but also how we think about and interact with it. Working as a Professor at USF has also lead to shift some of my practice from the studio to writing and researching. One of my most recent accomplishments is editing the Routledge Handbook of Sustainable Design. This academic text allowed me to layout bigger picture ideas about sustainability and design practice — it’s not about recycled plastics and save the trees posters — but rather thinking in systems, changing behaviors, and reshaping value systems. As I think about what to tell you are “high-points” or “low-points” in my career, it’s hard to separate them. I remember one of my mentors in college telling me that in order to have high points you also have to have low points otherwise your life is just flat. When I reflect back on the stories I’ve just shared — they all have both. The post 9/11 economy crash caused me not to move to New York, but that led me to grad school. In grad school San Diego wasn’t a city I really enjoyed, but I got amazing things out of my time at the University. Piecing together work I was sometimes living paycheck to paycheck but I was also doing things that I enjoyed and was learning from them. Not having a permanent residence for a year was a little scary, but gave me great opportunities. Newnham: What have been some of your favourite projects to work on and why? Egenhoefer: For a long time I was fascinated with the space that exists between yourself (human) and machines. I was fortunate a number of years ago to have a residency at the University of Brighton where I got to work in their plastics department. 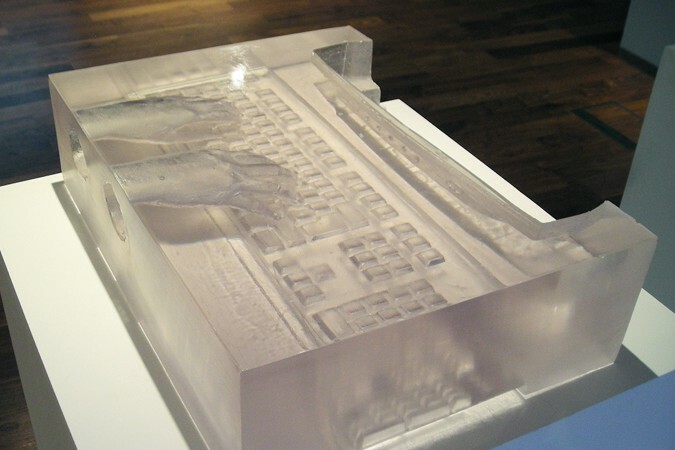 I made a resin cast of the space between hands and a computer. It was a very long process of making negative and positive and negative molds to get to the point where we were ready to pour the final sculpture. When we did, I poured it too fast and the whole thing cracked and went up in flames. It was one of those moments where the material really dictated the work and kind of created this metaphor for technology crashing. I ended up pouring a second version, but in a way I always like the one that “failed” better. Another piece that has a sense of material dictation is my Lollipop Grid installation. Given my interest in tangibility I’m attracted to candy as a medium because it evokes the senses and has a kind of seduction that technology also has. Candy (when unwrapped and exposed) will naturally melt. So as this piece sits in a gallery it very slowly melts. It only ever melted a tiny bit, but once it was installed in a gallery in Los Angeles during heavy rain storms. There was so much moisture in the air from the rain, the lollipops melted down to the sticks and there was a huge puddle of sugar on the floor. I never expected that to happen. 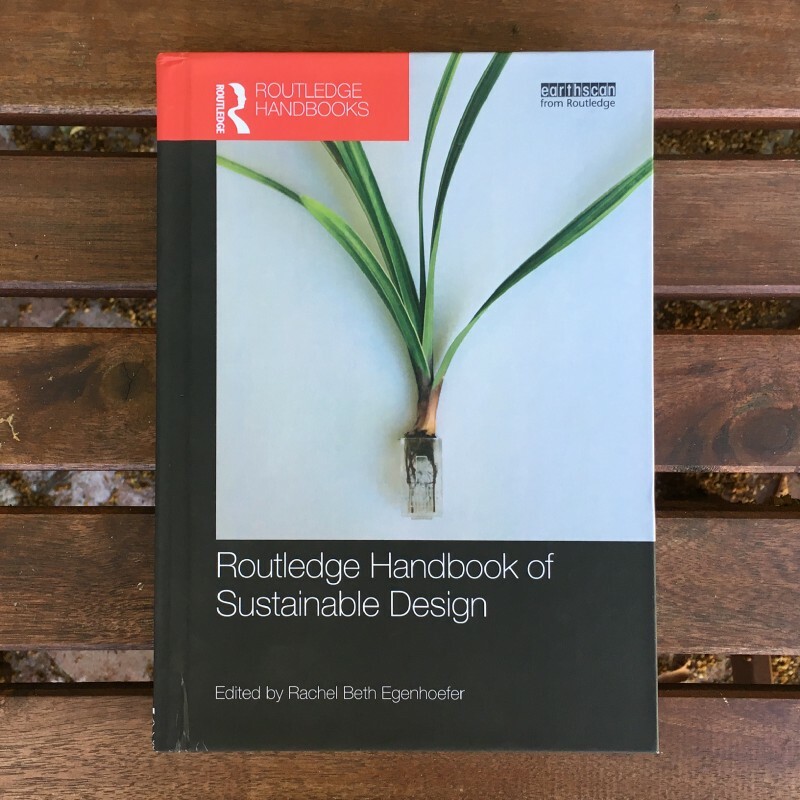 Doing the Routledge Handbook of Sustainable Design was also a really rewarding project because I got to work with so many different people and different perspectives to put the book together. Even though it’s an academic textbook, I got to know people on a personal level and hear different stories about how practitioners in different fields approach sustainability. We are going to need a lot of different people coming together to solve these huge global problems now more than ever. It also reminded me a lot of the human factors behind work, and academic work in this case. We’re academics yes, but we’re also parents, spouses, partners, friends… people who are juggling many hats at once. Newnham: Historically, a lot of people (businesses, educators etc) have tended to view design and tech as two separate entities — what’s your view on this and how do you see the two merging in the future? Egenhoefer: I think historically (good) design and many fields have been viewed as separate entities which is why there’s so many bad products out there! Design in many ways has been viewed as purely aesthetic which I think has lead to this separation. Good design is of course far more than just looks but also about communication, behavior and interaction. Right now “design thinking” is really hot and many people think they are merging design and tech through design thinking exercises. There are some good areas that design thinking taps into, but it can also be limiting. (After all, designers do more than think!) I hope in the future that design and tech (and many other fields) are merged into a systems thinking perspective where we look at how we interact with products, what experiences those interactions touch, and how that affects our communities and environments. Everything that designers put out into the world will leave an impact — physically obviously, but also in terms of how it affects behaviors. A classic example of this is to think about the car. When cars were first invented, there was no way to imagine that they would lead eventually to also inventing drive through fast food and smart phones, but those are just some of the things they want on to create. Newnham: The ethical side of tech and consumption features widely in your work — how do you think we get consumers thinking about the greater cost of products, not just financial but emotional, ethical etc? Egenhoefer: This is something I think about all the time. Right now it’s too easy to buy cheap products that are far removed from where their resources were mined and harvested and the people who made them, and on the other side — where they will end up when we “throw them away”. This ease has lead to habits that are hard to break. It’s also created huge socio-economic problems that can be mind boggling to try to solve. As I think back to some of your earlier questions, I talked about the connections I see between the tangible and intangible. In a way, this is the same thing — while we can’t actually see and touch the technology that sends text messages and updates to feeds, we also don’t see what or how our products are made, or where they end up. I think that connection has to come back. We need to be connected to how things are made, who makes them, and who they impact before, during and after we use them. But it’s far more complicated than just saying ‘buy local’ and ‘know your maker’ when you start to dissect global supply chains, socio-economic divides, race and class structures. My short answer is that we all need to slow down and connect not to technology, but to each other and our resources. Newnham: How does art help convey important messages and how does one start to research for such projects? What does the process look like for you? Egenhoefer: Art has the ability to make people feel, experience, and interact that is unique from anything else. It conveys messages in ways that can evoke the senses and allow us to ponder new connections. My process can be really different depending on the project. I always start with the concept — what am I trying to communicate. I believe that good art and design is much more than just pretty pictures, so for me ideas are important. Some of my projects that are site specific have responded to a space and so I start there. Others come from an idea that usually spurs from connections I see in the world. I consider materials a lot as well, so sometimes ideas come from materials and what they communicate. There’s often a back and forth. Newnham: Is there a piece of work you would love to create but have yet to do? Egenhoefer: Given my interests in sustainability and materiality, I sometimes think about how to make work that isn’t actually anything. Part of the problem we’ve gotten ourselves into in terms of sustainability is the need for more and more stuff. In some ways while I think about how to live with less in my personal life, I think about how to create with less. It ends up becoming an existential question of sorts — how to design nothing. After completing the Routledge Handbook for Sustainable Design, I became interested in wanting to do a more visual and accessible to non-academics book on sustainability, systems thinking and designing with values. Newnham: As tech advances at an exponential rate, and behavioral changes accompany that, what impact does it have on our ethical obligations — as humans, business-owners, parents etc? Egenhoefer: I believe we have an obligation to be aware of what it’s doing to us and become educated about it so that we are conscious consumers. I don’t think we should be passive consumers or passive designers. A lot of what’s happening right now is creating not just habits, but addictions, to all sorts of things that we sometimes don’t even realize. You see this in the ways communication has changed, how we spend our time, how we consume things, how we treat people. I think any time you buy something, it’s an ethical decision about where it came from and what you’ll do with it. I certainly don’t claim to be a super ethicist in this. I too am guilty of throwing away disposable coffee cups and going out to buy new tech products. I think we should be obligated to be informed, to ask questions, and make the best informed decisions we can knowing what these things are doing to us and our planet. I often have my students mediate or have quiet reflection time at the start of class. I do this so they slow down, and think about what they are doing. We should be mindful of how we live. Newnham: If you could go back in time, what advice — if any — would you offer a younger Rachel Beth? Egenhoefer: I don’t like to live with regret, instead I think things happen for a reason. So I’m not really sure what I’d say. Maybe I’d say, “Don’t worry, it will be OK.” But at the same time, I have a hard time listening to that advice right now.